Israel must legalize the majority of illegal West Bank outposts, a committee appointed by Prime Minister Benjamin Netanyahu to review the legal status of such communities recommended, Ynet learned Monday. The panel, headed by Supreme Court Justice (Ret.) Edmond Levy, also ruled that the State must devise ways to "ease land acquisition and zoning protocols for Jews residing in Judea and Samaria." The committee's recommendations were submitted to Netanyahu in June, but have yet to be made public. The Levy Committee, formed in January and comprised of Levy, Tel Aviv District Court Judge (Ret.) Tehiya Shapira and Dr. Alan Baker an international law expert, who was part of the team that devised the Oslo Accords, met harsh criticism from the Left, which claimed it was biased. The committee's findings stand to significantly change the legal reality in the West Bank, especially when compared to the 2005 Sasson Report on construction in the West Bank, which deemed 120 outposts as illegal. Tackling the issue of sovereignty, the Levy Committee ruled that in its operations in the West Bank, "Israel does not meet the criteria of 'military occupation' as defined under international law." The ruling is based on the fact that "no other legal entity has ever had its sovereignty over the area cemented under international law," the committee said, adding that the latter included Jordan, which ruled the area prior to the Six Day War. West Bank settlements are legal since that is no provision in the international law that deems that having Jewish population in the area is illegal, the report added. The committee further noted that in ruling over the latter, it did favor legal opinions submitted by right-wing organizations over those presented by Peace Now and Yesh Din and B'Tselem. As for the matter of Israeli construction in the West Bank – and especially the question of illegal outpost – the committee ruled that the State must find a way to legalize and regulate the construction. 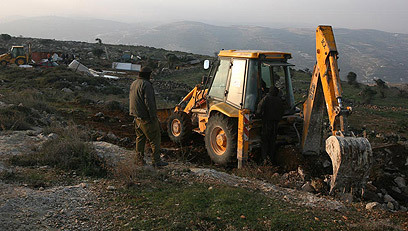 West Bank settlements and outposts were created as the State's bidding, the report said, and the settlement movement was encouraged to continue its mission. The report further urges the government to regulate the outposts' municipal status, enable natural growth, accelerate the regulation of zoning and planning and refrain from executing any demolition orders pending further legal review. Contradicting current government policy, the committee also stressed that the Civil Administration must allow private construction within existing communities' limits; including in areas where there is IDF presence. Justice Levy criticized the "lack of clear government direction and policy" in regards to West Bank settlements. "The conduct we discovered vis-à-vis the Israeli settlements in Judea and Samaria is unbecoming of a nation that has made the rule of law one of its primary objectives," he wrote. Still, the committee's recommendations are not mandating. Netanyahu is likely to ask the Ministerial Committee on Settlements to review the report. See all talkbacks "'Government must legalize settlements'"